Back in November 2016 and March 2017 we published blog articles about the additional option of non-invasive prenatal testing (NIPT) to the fetal anomaly screening pathway. Evidence has shown that introducing this test could reduce the number of women undergoing invasive diagnostic testing, which carries a risk of miscarriage. NIPT will be offered to women who have received a higher risk/chance result of having a baby with Down’s, Edwards’ or Patau’s syndrome following first trimester combined or second trimester quadruple screening. 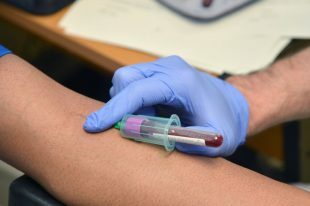 It involves taking a blood test from the pregnant woman. Do have a look back at the previous blog articles to find out more about NIPT, how it works, the work going on behind the scenes to support its evaluative roll-out and what this will mean for women who choose to have screening. The NIPT information and education group is planning a series of 2-day national training events to help healthcare professionals support women in making personalised informed choices about screening for Down’s, Edwards’ and Patau’s syndromes. The screening quality assurance service (SQAS) and screening and immunisation teams will monitor attendance at the national training events and the compliance of provider trusts with local cascade training. This local training requirement is also included in the 2017 to 2018 fetal anomaly screening service specification. Through 2017-18 the FASP programme will undertake a scoping exercise to plan how NIPT might be integrated into the current screening pathway as an additional option for women with a higher risk result. This will require education and training of all staff contributing to the screening pathway and development of local pathways and policies in readiness for an evaluative roll-out in 2018-19. We’re asking provider trusts to identify and nominate up to 3 delegates each to attend both days. These 3 ‘NIPT champions’ will be responsible for ensuring all relevant staff members in their organisations engage in a defined programme of cascade training. Screening and immunisation leads will attend this day along with representatives from SQAS and NHS England and the NIPT champions. Training will be delivered by the national programme team, national SQAS team, the Down’s Syndrome Quality Assurance Support Service (DQASS) and relevant affiliated experts and laboratory representatives. This day will be attended by NIPT champions only. Training will be delivered by the national programme team, supported by PHE Screening’s Information and Education for Public and Professionals (IEPP) team, and in collaboration with Antenatal Results and Choices (ARC), the Down’s Syndrome Association (DSA) and Support Organisation for Trisomy 13/18 (SOFT UK). what does personalised informed choice look like? For more information or to book a place on the training, please contact Louise Toal (louise.toal@nhs.net). We will continue to share further information on the plans and progress for the evaluative roll-out of NIPT via the PHE Screening blog. This information will be relevant to any healthcare professional involved directly or indirectly in any part of the Down’s, Edwards’ and Patau’s screening pathway, so please make you and your colleagues are signed up to receive updates (see below).